Extraordinary experience! Imagine white frozen see which never storms. Sea waters are covered with solid ice, endless dramatic white as far as an eye can catch. Listen to the sound of crackling ice, crashed ice blocks rise from the icebreaker hull letting and dark water splashing out.In the beginning of winter ice is not more than 30-50 cm thick, but by April it could reach up to 2 m.
During 3 h cruise you will have a tour all way down to the engine rooms and all way up to Captain’s bridge. On board you can relax in cozy saloon enjoying warm juice. Bar is also available for drinks and snacks. Before retuning to the harbor we will make a stop. Go for walk on the frozen sea. 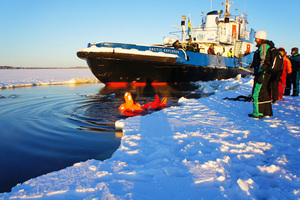 Icebreaker makes pool free from ice and every visitor may have a swim in dark icy water in floating survival suite. Before leaving the ship the captain will present the Cruise and Swim certificate to everyone as a memorable gift.